And so the journey of Greece ended and Turkey started! In the 4 weeks we have been around the west and south-west coast of Turkey, we only stayed for longer than 2 days at any given place because of the weather. The Meltemi has certainly found Turkey at the same time we did, and on and off we needed to change our plans to accommodate this atrocious friend of ours! 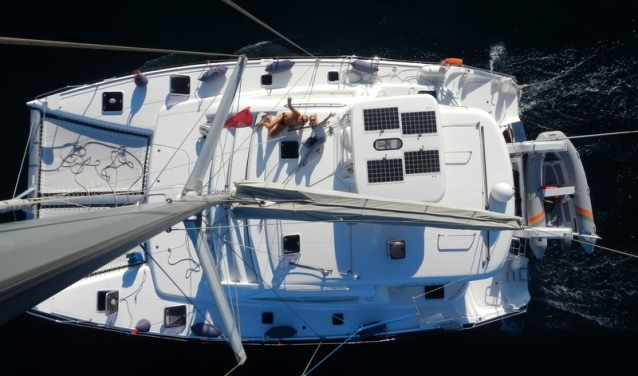 Sailing from Kos to Bodrum was only a small stretch and in no time we were there – For a change we have enough and not too much wind (the 11 knots) and from a direction that makes sailing with a full Genoa possible with only one engine going. It was just enough to ease the rolling waves from the side. As we anchored we could still see Kos Island on the horison… I will miss Greece. We just had such a great time and loved the culture, food, music and the islands never disappointed! 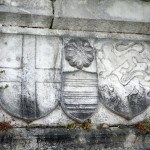 What did make it slightly easier to move on, was (again) customs! When it was time to clear out of Greece, Johann took our passports and boat papers into customs. The drama started with a bang! 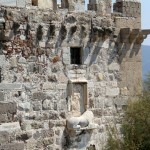 They where jumping up and down because I did not have a entry stamp into Greece! Well, Lefkas customs (where we entered Greece) did not want to give me one, because I am a crew member of the boat and not a visitor to the country! As long as I am attached to the boat I don’t need an entry stamp!?? To become a “visitor”takes a bit more than just a stamp … For that privileges you have to pay an agent 80 Euro (that is necessary if you want to leave the boat for more than 24 hours or want to leave to country in any other way than sailing, which Johann had to do to fly back to Australia). Customs wanted to charge me a penalty of 600 Euro for the missing entry stamp!!!…. which did not go down well with the Captain! 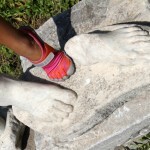 After many a hard words back and forth and making sure they clear it up with customs at Lefkas, we got off the hook. I am not sure if they have ever phoned Lefkas? We later heard from another boat, that Customs have locked up a young crew member of another boat for 13 days for the same reason! So I guess all though it left a bitter taste behind in my mouth, I am lucky to tell the story about someone else. I cannot imagine being in that situation at all! So Turkey came around just in time and I guess I was ready to kiss Greece goodbye for now! 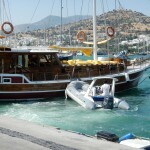 The marina in Bodrum seems to be booked out months if not a year in advance. 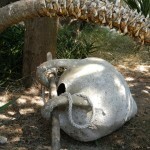 The anchoring spots around town seemed to be very full on investigation. We are expecting the wind to pick up to 25 knots (and being gusty as well over the hills) and we preferred to anchor in a bay close by where there were less boats (hopefully meaning less chances of getting into trouble). We were there for a short while on our own, when a few Gulets came in full of young tourist with music coming from massive speakers (that will wake up any city!) dancing on the roof of the boat on the crazy Gangnam Style song of Psy!! It looks like heaps of fun…. but the kind of fun that you don’t want around for too long! Luckily they only stayed for a very short swim! Young tourist dancing on Psy’s crazy Gangnam Style song!! The bay was a good 10 min dinghy ride away from town – a bumpy splashy wet one too! 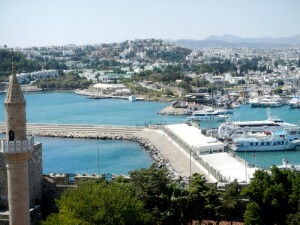 Bodrum is absolutely worth it! So much different to our experience 25 years ago when we were deported back to Greece because they could not issue visa stamps on that day, being a religious holiday! Only on our second try to enter Turkey on the same day, with the help of a Turkish speaking Greek fisherman, did we manage to get the OK to join FlyerII (the yacht we were guests on at the time). Our passports were held back…actually thrown back into a bottom drawer until further notice! It did not come easy as we were we taken to the Chief of Police and only after many a hard words (poor fisherman!) 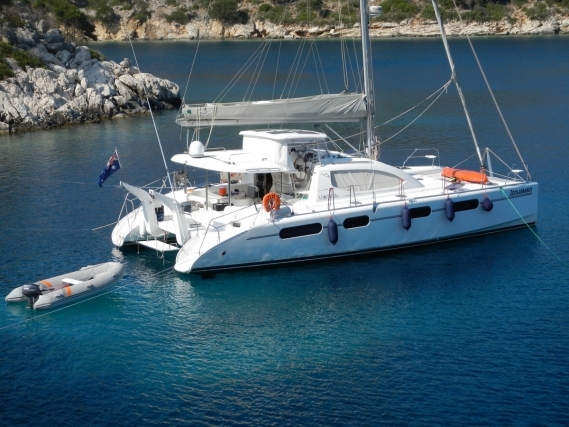 were we aloud to spend the next 2 days in and around Bodrum. We got it back, stamped and ready to go 2 days later without a problem and with the biggest smiles! 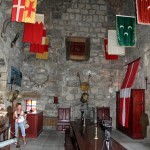 Bodrum town is dominated by the Castle and its history. The visit to the castle was absolutely amazing! 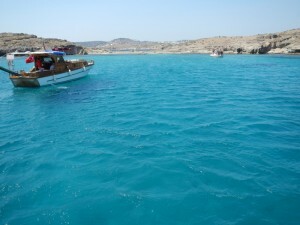 Never miss that if you happen to get to Bodrum! 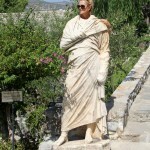 A little bit of background on Bodrum: Bodrum used to be called Halicarnasuss of Caria in ancient times and was famous for housing the Mausoleum of Mausolus, one of the Seven Wonders of the Ancient World. 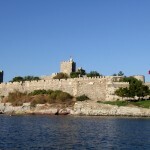 Bodrum Castle, built by the Knights of St John in the 15th century, overlooks the harbour and the marina. 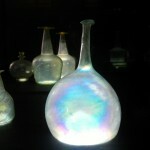 A spectacular sight at sunrise, sunset and during the evenings when it is beautifully lit up! 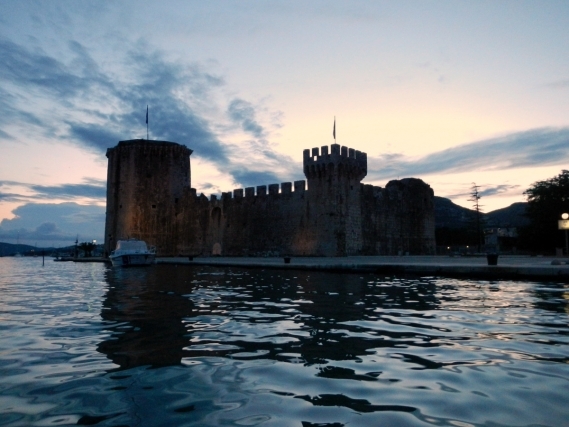 When the Knights of St. John arrived to build their fortress, they found the ruins of an old castle, now known to have been built by the Dorians roughly around 1100 BC plus all building material from the mausoleum readily available to use in building the fortress. It is known that the “Father of History”, Herodotus was born in Halicarnassus. 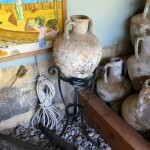 He lived there during the 5th century AD. 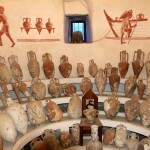 On the same grounds of the castle is the Museum of Underwater Archaeology with some amazing finds from a ship that sank in a bay (where we later went and anchor) over 2000 years ago with some very fine pieces of glassware on show that is still perfectly intact – probably an indication of how well packed they were for transport. Well … on most of these points made, I could not agree more! 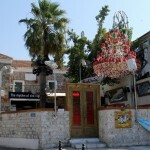 Nightclubs, cafes and restaurants stay open all night to accommodate Bodrum’s party lovers and night owls. 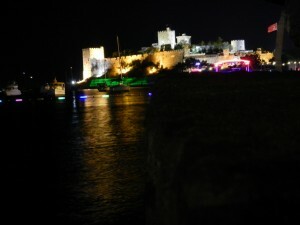 The night life of Bodrum is something really very special. 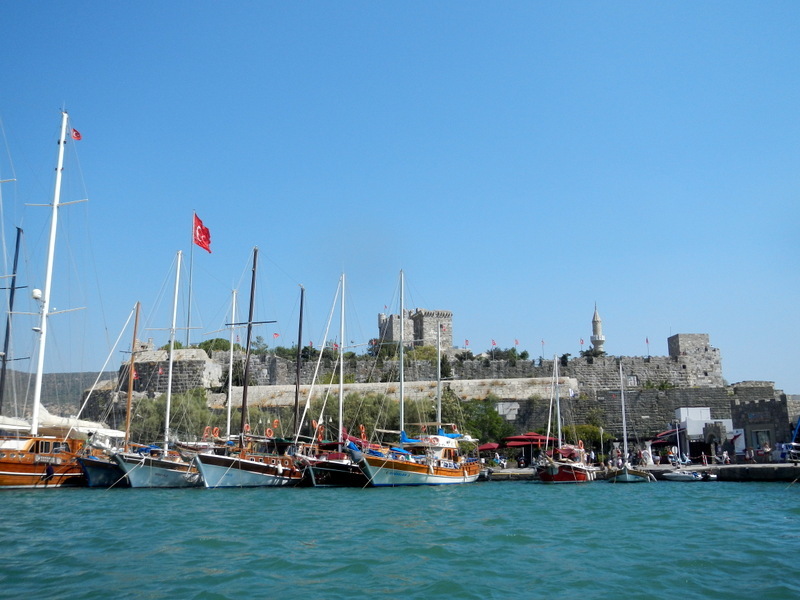 Even the Turks will rank Bodrum after Istanbul as Number 2. It is pumping music and lights all night long with streets buzzing with shoppers and strollers looking for a place to eat or drink or just to enjoy a walk through the buzzing streets of Bodrum!! 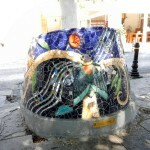 Bodrum probably has more bars per area than all other places in Turkey, appealing to all tastes. Bar Street is one mile-long street that runs parallel with the sea, so all the bars and restaurants, cafes on the right side offer a sitting area on the beach with the scenic view of the castle. My favourite of all are the intimate seaside cafes with magnificent views of the illuminated castle and the array of colour lights playing in distorted lines on the still water of the bay. One of the trendiest discos in the world, the HALIKARNAS DISCO will catch your eye immediately with its brightly neon lit massive pillars! The sounds coming from it will make you realise that it is bigger than big! We were anchored out the second time round, in the bay near the disco, and the music and laser lights were non-stop going crazily till 4am in the morning! 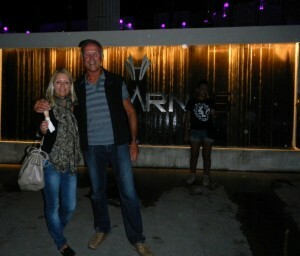 Take note: Halikanas disco was already operating when we last visited Bodrum 25 years ago! So it has been around for a long time! Customs, the chase for a gas refill (that went on and on and in the end we forgot to pick it up again! 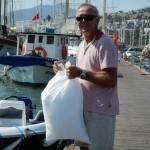 ),for the bag of crushed ice we were so happy to find after having asked just about everywhere … the bag was about half the size of the dinghy!!! (It came in hand for a very long time!) and the colourful decorations around town! Crushed Ice … the only size bag we could get!! LOL!! 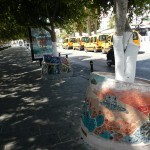 The colourful night life of Bodrum is as pretty at daytime! This is how the dock crew help the big Guletts to dock in heavy wind – by pushing them in position. Previous PostKos Island … Our last port of call in Greece for this year!Next PostKNIDOS … a wonderful ancient city up close and personal … not without drama!